While the Supreme Court narrowly upheld the core of President Obama's health care law Thursday, the justices came down hard against a provision that would have expanded Medicaid to millions more low-income Americans. As passed by Congress, the legislation expanded Medicaid to nearly everyone making up to 133 percent of the federal poverty line, which would have added an estimated 16 million people to state Medicaid rolls over the next seven years. 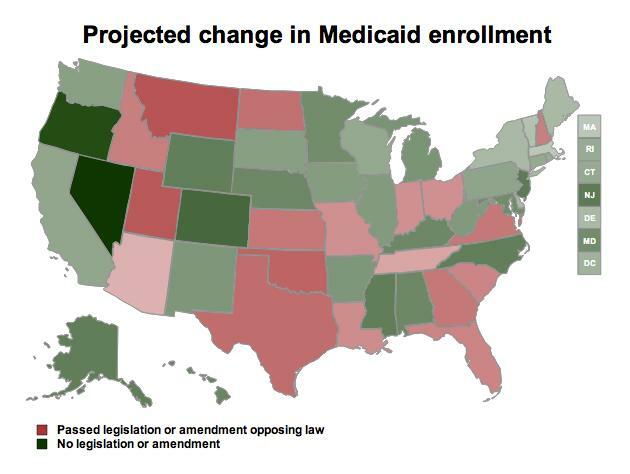 States that refused to comply would run the risk of losing all Medicaid funding. Seven justices ruled that the move went too far, and that the government can only withhold the funds to expand Medicaid, not existing money that helps states run their pre-expansion programs. So will more conservative states take advantage of this new leeway and reject the expansion? That's what Nebraska Gov. Dave Heineman, a Republican, suggested Thursday, when he said that he opposed expanding Medicaid in his state. A spokeswoman for Texas Gov. Rick Perry, who has made a show of rejecting federal funds in the past, wouldn't say whether he would block the expansion. Medicaid is often one of the biggest lines in states' budgets, and that share is growing as health care costs continue to rise. But some of the early opposition may turn out to be saber rattling. The federal government is funding 100 percent of the state expansion for the first few years before reducing their contribution to a permanent 90 percent. That's a much higher contribution than the government currently makes for Medicaid (at 57 percent), which every state now participates in, even though it is also an optional program. And in addition to the government providing a sweet deal, the states who sued over the expansion account for most of the country's unemployed people, which might make it particularly difficut for their governors to turn down a chance to insure their residents at a tenth of the cost. According to the National Journal's Ron Brownstein, the 26 states that sued over the Medicaid expansion contain 55 percent of the nation's uninsured, a total of 27.6 million uninsured people. Texas alone has 6.1 million uninsured people. Expanding Medicaid in Texas would cover 2.0 million people, the Kaiser Family Foundation (pdf). Conor Skelding contributed to this report.